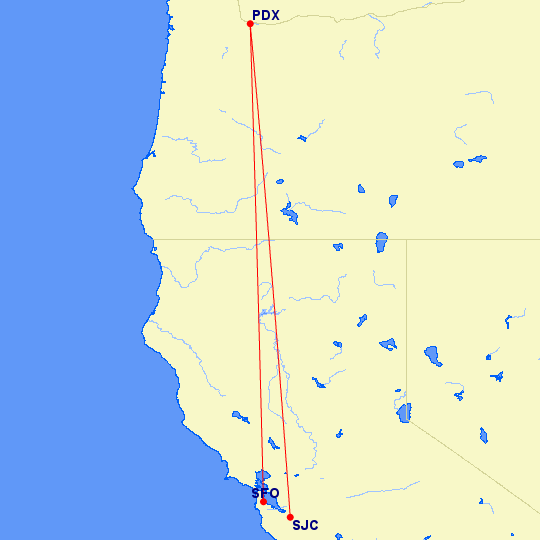 Thanksgiving Day saw me taking a quick journey between the Bay Area to Portland, and as the journey involved Horizon, my favorite US regional airline, I've composed this brief (and fawning) documentation. I arrived at San Jose's Norman Maneta International Airport some thirty-five minutes before my scheduled departure time of 6.15a. After an expeditious transit through airport security, I arrived at the gate area where N400QX, a Bombardier Q400 turboprop aircraft in the colors of the University of Idaho Vandals, was about midway through the boarding process. The flight itself was a joy. From seat 1B, the forward exit row seat, I enjoyed some brief conversation with the flight attendant in her jumpseat and, after napping for a few moments after our sprightly takeoff, I dug into some markets-related reading (an outstanding textbook by Kirkpatrick and Dahlquist) for the majority of the flight. On the right side of the aircraft, a radiant melange of red and orange combined to render the sunrise, but being in a left-side aisle seat, I was in a decidedly suboptimal spot to enjoy it. N400QX landed under overcast skies on runway 28L at PDX, with our short final approach taking us over the aloft PDX, where I'd be staying on this trip. The stay in Portland did not disappoint. Although Thanksgiving is naturally a family affair and my trip to Portland was decidedly solitary in nature -- its purpose being to facilitate strategic, introspective thinking and writing with respect to work -- I'd be enjoying the archetypal turkey feast with a gathering of extended family on the next day, Friday, in the Bay Area. Thanksgiving Day itself was all mine, and fruitful. I journeyed back to San Francisco on Friday morning, with the flight being nothing short of spectacular. The day began well before dawn, with a few hours' work logged before I departed the aloft hotel at approximately 9.30a. The cosmos smiled upon me that morning and bestowed the next minutes with impressive efficiency: I arrived curbside around 9.40a, transited security in less than two minutes thanks to an empty TSA Pre-Check lane (while the hordes seemed to be queuing quite lengthily in the adjacent lanes), and was among the first passengers to board the 10.15a departure to SFO, again operated by a Horizon Q400 aircraft. Slightly before midway through the flight, as I was savoring the heady texture and chocolatey taste of a Ninkasi Oatis oatmeal stout, the microbrew of the month at Horizon -- and get this, poured free of charge to economy class passengers -- Mt. Shasta came into view somewhat in the distance. Moments later, the snow-capped peaks of the Trinity Alps beckoned spectacularly just below (the maximum cruising altitude of the Q400 is only 25,000 feet). Some time later, now into an initial descent, we overflew Santa Rosa, with the Charles Schulz Sonoma County Airport (STS) clearly visible. But the best sightseeing came later still: a traverse off the western coast of San Francisco and the peninsula, before cutting across Redwood City to align with SFO's runway 28L approach.